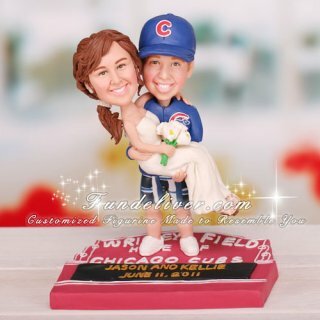 This is a completely customized Chicago Cubs Wrigley Field Marquee Sign cake topper ordered by one of our customers. They would like the groom to be holding the bride in his arms. 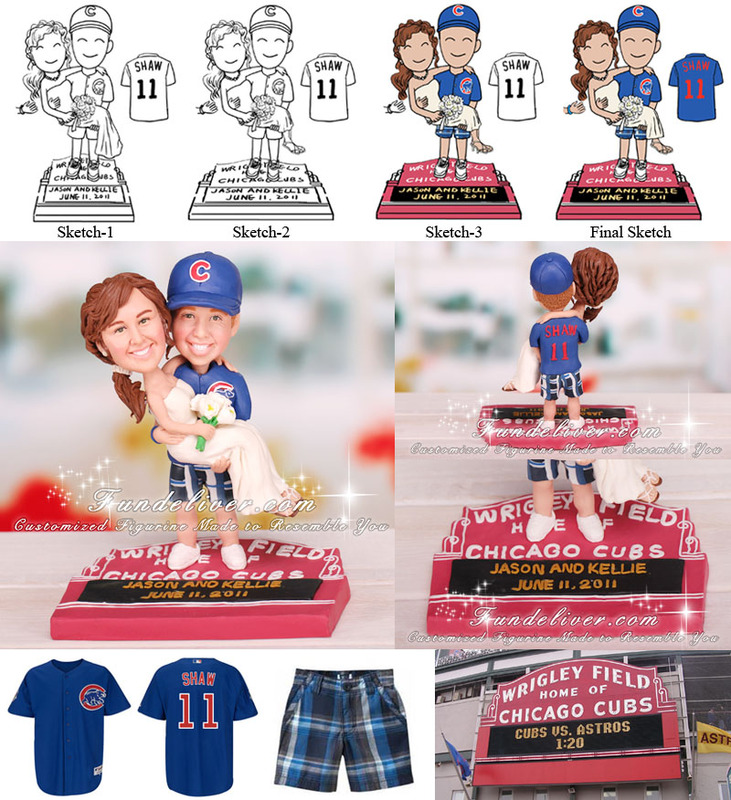 The groom is wearing a blue and gray plaid shorts, blue Chicago Cubs hat, blue Chicago Cubs bracelet and Chicago Cubs jersey with the name “SHAW’ and the number “11” on the back of the jersey in red letters/numbers. The bride is wearing a nice ivory colored strapless wedding dress that flows over her feet but not to the ground. She is wearing pearl stud earrings and a pearl necklace. Her hair will be wavy and curly and pulled to the side in a pony tail over her right shoulder. The bride is holding a bouquet of ivory colored flowers in her right hand, her left arm is around the groom’s back with her left hand on the groom’s left shoulder. Differing from other baseball cake toppers, the most featured part of this Chicago Cubs cake topper is the base. They would like the couple to be standing on Wrigley Field marquee sign with the words “JASON AND KELLIE” on the top line and “JUNE 11, 2011” on the bottom line of the black message space. Both lines are written in yellow letters and numbers.